The spiritual center of Olympia Friends Meeting is in its Meeting for Worship. Meeting for Worship takes place on the basis of silence, and is unprogrammed. We gather, still our minds, open our hearts, and settle into a reverent and expectant silence to wait upon the Light. We believe that in this opening of our hearts to the Spirit, we are contributing to the common worship of all present, as well as to our own renewal. We have no minister, as we believe the Light is directly available to all, and all may minister. This time may pass in silence, or individuals may be moved to speak briefly out of the silence. Leaving a space of time between each person speaking allows the ministry of each to be respectfully heard. Meeting ends after an hour, when a designated Friend shakes hands with a neighbor. Introductions and announcements are followed by a social time with refreshments. Our children are an important part of Friends Meeting. They join us for the first fifteen minutes of Meeting for Worship, then are led out for the children’s program, with childcare for the youngest. Olympia Friends Meeting is part of the liberal, unprogrammed branch of Quakerism. All who might find the Quaker Meeting for Worship helpful in their spiritual search are welcome. We come from a wide variety of religious backgrounds; most of us were not raised as Quakers. Although the roots of the Religious Society of Friends (Quakers) are in Christianity, some individual Friends do not call themselves Christians. 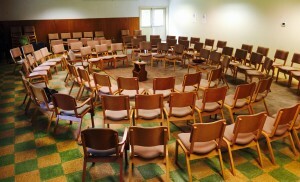 Today’s Friends are very comfortable with the wide range of beliefs in any one Quaker meeting. The Meeting welcomes non-traditional families and people of all sexual orientations and gender identities. If you have never been to a Quaker meeting before, do not expect to find women wearing bonnets or men dressed like the guy on the Quaker Oats box! On the first Sunday of the month the meeting holds a potluck breakfast at 9 a.m. at the meetinghouse. On 2nd Fridays there is a Quaker Women’s Potluck. On 2nd Sundays the Meeting for Worship for Business is held shortly after rise of Meeting, guided by the Meeting’s clerk. All are welcome. Local Quaker meetings are called “monthly meetings” because they gather once a month to conduct business. On the third Sunday of the month a query is read that stimulates sharing during Meeting for Worship. Periodically there are special presentations or discussions held after Meeting for Worship. Dates and times are announced at Meeting and in the Newsletter, and all are welcome. Olympia Friends Meeting’s meetinghouse is at 3201 Boston Harbor Road NE; Olympia, WA 98506-2800. Coming from Olympia it is just past Priest Point Park, first driveway on the left beyond the intersection of Boston Harbor and Flora Vista roads. The building originally housed the Olympia Salmon Club, an environmental and educational group devoted to preserving wild salmon runs. We acknowledge that this land and water is the traditional territory of the Steh-Chass people. The Steh-Chass people are of the Squaxin Island Tribe. The surrounding mountains, valleys, shorelines, and waterways are imbued with their presence. We seek to nurture our relationship with our Coast Salish neighbors and our shared responsibilities to this place, their homelands, where we mutually abide.